Although ballet and diving appear at first to be very different, similarities do exist between the two activities. The same muscle groups are used, similar skills are required and even some of the same injuries are common. 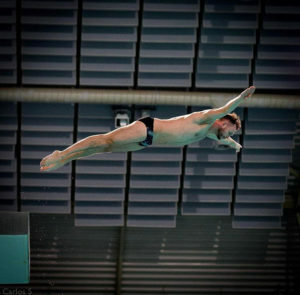 Practicing ballet as a form of cross-training could certainly improve a diver’s performance on the boards. The athletic cross-over effect has undoubtedly enabled me to quickly ‘convert’ my existing skills and compete to a high level in a new sport. Flexibility is very important in diving despite the fact that the sport is often seen as a strength-based activity. Flexibility helps divers immensely and can reduce the likelihood of injuries to joints such as the knees and shoulders. Ballet relies heavily on flexibility to create graceful movements (and to a greater extent than standard diving training drills and exercises would offer), so this puts any diver with a background in ballet at a huge advantage. 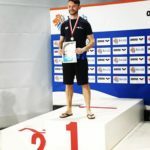 GB Diver Tom Daley’s coach, openly credits his graceful performance in competitions in part to flexibility that he learned from ballet training. She believes this training has helped him achieve a higher level of body control, balance and a sense of rhythm and timing. On the boards, speed can mean the difference between a hurdle and a run up. Ballet strengthens the legs, knees and ankles and makes use of rapid leg movements, all of which promote power and speed in running. The sheer variety of turns and other complex movements in ballet practice trains agility and the body’s ability to recover speed quickly. Picture a ballet dancer and you might not immediately think of strength and power, but ballet actually requires significant strength, stamina and power output. Ballet also creates muscular strength without adding significant amounts of bulk to the body; this is especially important for platform divers who need strong legs but don’t want muscular bulk that could hinder their performance. Good balance is vital to being effective as a diver. Ballet also requires good balance, as many of the techniques used in ballet involve jumps, turns and poses that would put a person without training off balance. Improving balance through ballet training makes it easier for divers to make leaping movements without losing their footing and to stay on their feet while balancing on the boards. Ballet requires a lot of focus, since most movements in ballet must be made with precision while appearing graceful and effortless. This focus is also a major factor on the boards, allowing divers to follow complex dives and track the position of the body in the air, which may determine whether the diver makes it to the water with a ripped clean entry. Ballet training can also reduce the effects of performance anxiety, allowing divers to dive their best even if they get nervous in front of crowds. Ballet and other forms of dance are considered to be aerobic because the muscles used during dance sessions and training require a large amount of oxygen in order to perform; this results in an increased workload for the lungs and heart as they attempt to provide this oxygen. Aerobic exercise strengthens the heart and circulatory system, making it easier for the body to deliver oxygen and nutrients to the muscles during periods of intense muscular work. For divers, this translates to increased endurance on the boards, allowing their bodies to run, jump and face impacts of water for a longer period of time without tiring. If you would like to hear more about my ballet and dive training, I will be speaking at the Barreworks Tribe Event on 7th April from 5-6pm. Come and be inspired by the potential of training at the barre and PLEASE come along with any questions you might have for me!